The Penguins have managed to score only 15 goals in those 13 losses. After a night of missed wide open nets and one too many passes against the Washington Capitals, Sidney Crosby scored a beautiful backhand goal against the New Jersey Devils. That’s his 11th goal in 33 games this season. Some critics were speculating injury while others questioned a mental lapse. Turns out Crosby is fine. Despite the loss, Crosby returned to form against the Devils. He set up Wilkes-Barre/Scranton call-up Brian Rust with some great chances no less than three times throughout the game. Had Crosby been passing to someone with a bit more skill, they would have been buried. Despite what the scoreboard says, Marc-Andre Fleury had a good night. He stopped two breakaways with ease and kept the Penguins in the game per usual. It’s hard to say he was 100% at fault for any goals allowed. Fleury is a big part of this team’s success despite the injuries. His teammates owe him a bailout from time to time. That didn’t happen against the Devils. Of the three goals allowed, two could have easily been prevented by playing tougher around their own crease. For how much praise Rob Scuderi gets on the penalty kill, he certainly look flatfooted tonight. 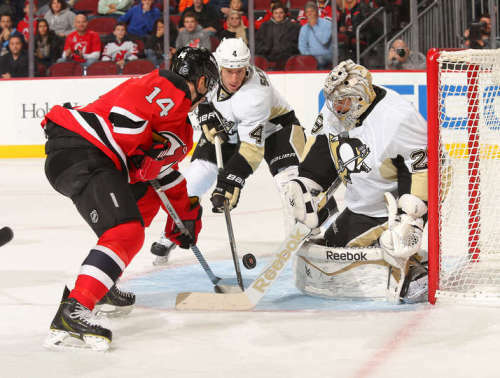 Scuderi was the lone defenseman between Travis Zajac and Marc-Andre Fleury on the Devils’ first goal of the night. Then after a turnover in the offensive zone, Kris Letang had little urgency in clearing the puck from Adam Henrique to give the Devils their third of the night. It’s surprising that this was a problem for the Penguins tonight as this is usually one of their strengths. Perhaps being shut out in two days prior kept them focused on offense a little too much. Scuderi also backed off of future NHL Hall of Famer Jaromir Jagr to give him a wide open lane for his fifth goal of the season. Again, surprising to see Scuderi take such a step back after playing much better this season. Hopefully just a defensive lapse. Hard to just put the blame on him when everyone seemed to be putting defense second tonight. Rick Tocchet screaming “shoot!” while the Penguins were on the power-play sums up their effort on the man advantage. With Kris Letang and Derrick Pouliot on the back end, their first power-play looked promising. Derrick Pouliot came through the neutral zone side by side with Kris Letang. Pouliot then passed it to Sidney Crosby who was skating parallel to the other forwards. Unfortunately, the Penguins didn’t even manage a shot on their first chance. Crosby looked great at the goal line and Malkin had eyes on the half wall. But those looks are nothing unless they take a chance and shoot. Crosby is back on the goal line for a reason. The Penguins had a much better effort offensively, but perhaps it was too much. Mike Johnston’s system is about puck possession and the Penguins were lacking in that aspect tonight. Eliminating the fancy plays and just getting the puck north worked for the Penguins at the beginning of the season and it will still work now. No point in trying to play Harlem Globetrotters with call-ups anyway.